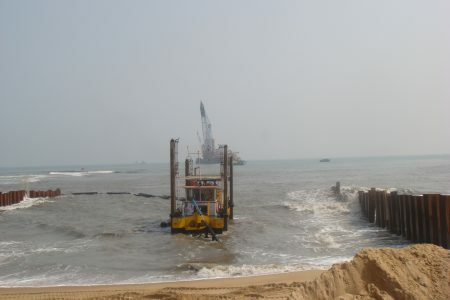 Trenching & Backfilling of 1440m IOCL near Paradip. Trenching to lay three 48” Pipelines (varying 4.0 – 4.5mm) in a single Trench of large bottom widths (varying 50.0 – 75.0m). Woking on high intertidal zones and site prone to rough weather conditions. Shore approach is critical. DDIL depolys Amphibian CSD Dharti IV to trench close to the end of Cofferdam which is very near to the shore line. 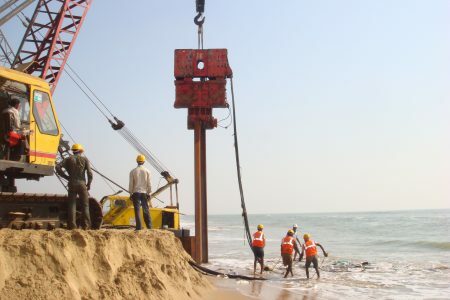 · Trenching Soft soil sections with Cutter Suction Dredgers Dharti XII and Dharti XI and trenched material side-casted at a distance of approximately 100~150m by floating Pipelines / rainbowing, depending on currents and permissions. 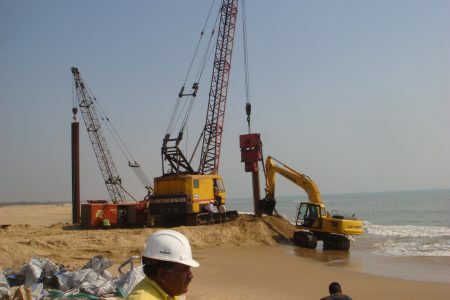 · Construction of Cofferdam with sheet piles for about 150m in the inter-tidal zone. 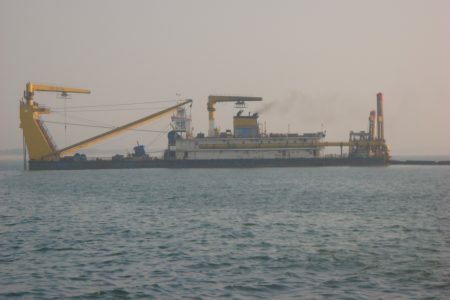 · Use of an Amphibian Cutter Suction Dredgers to dredge the trench near shore and within the Cofferdam. · All the dredgers equipped with online monitoring systems to monitor alignment of trench and progress of depth and bottom width. · Daily surveys carried out using survey boat equipped with Multibeam echo sounder to monitor trenching operations. DDIL completes project in compliance with high standards of QHSE as per time Schedule.